If you are tired of the same old chicken dinners, this easy chicken recipe adds Mediterranean flavor and some surprising spices. I love this chicken recipe because it is easy and the flavor is distinctly Mediterranean. The use of ginger and cinnamon give this easy chicken recipe an unusual but wonderful taste and the fact that it cooks up in one pan means it is a breeze to make and clean up is easy as well. Saffron is a bit on the expensive side but a little goes a long way and you probably have the rest of the ingredients in your kitchen already. I like to serve this with couscous, but you can serve it with rice or roasted potatoes. 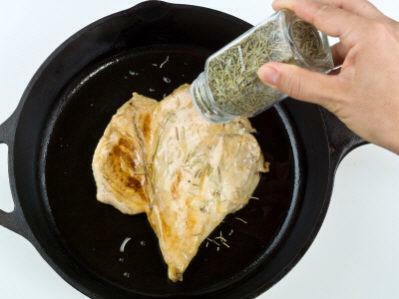 Use a pan that is large enough to hold all the chicken pieces and that has a lid. Add the oil to the pan and place the pan over a medium high heat. Add the onions and sauté the onions until they start to soften. Add the cinnamon, ginger, and saffron. Season the chicken liberally on all sides with the salt and pepper. Brown the chicken on all sides in the pan. Add 1 cup of water and cover the pan. Lower the heat to medium and cook for 15 minutes. Once the chicken breasts are done, remove them from the pan and continue to cook the legs and thighs until they are done. About 10-15 minutes more but test to make sure they are done. Remove the remaining chicken from the pan and add the honey. Continue to cook until the sauce is thick. Add the chicken back to the pan and cover with the sauce. Cover and cook for 3-4 more minutes until the chicken is heated through.